The Red Hook Star Review had the scoop on January 17th, with WNYC catching up a few days later in an article on their blog, and the New York Times eventually covering the issue a week later. What was the story? The proposal from the U.S. Customs office to end inspections at the Red Hook Container Terminal. The office stated, in the WNYC article, "the changes were intended to consolidate operations and save on federal spending." The article went on to state that the decision was made as the result of recommendations "from a working group, which included trade stakeholders, that was tasked by the federal government to find ways to improve productivity." Officials from Customs and Border Protection said they spent more than a year considering whether to close operations at Red Hook. In a letter to the Port Authority of New York and New Jersey dated Dec. 5, a customs official, Adele Fasano, stressed that the amount of cargo was “a relatively small percentage of the international cargo entering the Port of New York/Newark.” The Red Hook Container Terminal handles about 1 percent of the containers coming into the Port of New York and New Jersey, or about 110,000 containers, each year. The other container ports combined process about three million containers each year. Stating that in 2011 only 6% of containers were inspected at the Red Hook terminal, "Anthony Bucci, a customs spokesman, said officials concluded that consolidating operations would “provide more expeditious processing of containers requiring examination.”"
“Red Hook is the wrong location.” Container shipping there, he said, is both inefficient from a transportation perspective and standing in the way of the city’s other plans for the waterfront, including the eventual development of the southern portion of Governor’s Island. Rep. Nadler and Chris Ward have both supported a plan that would eventually move the container terminal to a larger site in Sunset Park, where Rep. Nadler has said the containers could be loaded onto a newly built cross-harbor freight rail service that would take trucks off the road and, he asserts, finally make a Brooklyn port economically and environmentally viable. But we'll be waiting a while for that to eventuate. Another shorter term issue concerns jobs. What impact would the U.S. Customs Office decision have on jobs? 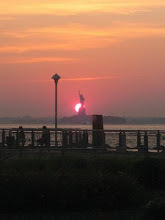 Would it precipitate the ceasing of all operations at the Red Hook location? This is a terminal that has just seen a change in operators, with the ousting of American Stevedoring in October last year (story here), and the reclaiming of operations of this publicly owned site by the Port Authority. With this uncertainty as a backdrop, there has been the question of whether the extra expense that the off-site customs inspections would induce would be prohibitive, forcing shipping companies to take their business elsewhere. The jobs on the waterfront, some fear, would then evaporate or move elsewhere, damaging Red Hook's local economy. But what are these extra costs that would force these businesses to flee Brooklyn? 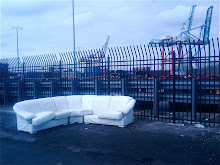 Well, first, what is coming in to the Red Hook terminal? By the description in the New York Times article, it's mainly beer (via Phoenix Beverages, who seem to have also taken over the stevedoring operations at the port since the eviction of American Stevedoring) and, yes, bananas. According to the NY Times article titled, "In a Plan to Close a Customs Post, Seeing Harm for Beer, Bananas and a Port Itself", the additional cost of the off-site inspections, if passed on to the consumer, could be an additional 6 cents to a bottle of beer, and an additional "couple of cents" to a pound of bananas. Is this additional cost prohibitive? Is it one that the consumer would or could not bear? The cost vs. benefits argument has very little cache in Long Beach where, since 2006, they have seen a reduction in harmful emissions from ships, as well as trucks and other port related machinery, by huge percentages (up to 70%), bringing resultant environmental and health benefits to their port side communities, while economically prospering. Which brings me back to the bananas. While we're worrying about what price impact the revised customs practices will have on our goods and produce, the bananas that come into the Red Hook port are already carrying an extra hidden cost. It's the cost of having a huge ship idling at the edge of our dense residential community - and that's not all. Despite the plan to plug cruise ships in to shore power at the edge of our neighborhood, bringing all the benefits that have been discussed over and over again in this blog, there is no such plan to do the same thing with the container ships. At one time, after the impacts of ship emissions were finally being given some much needed attention in our neighborhood, American Stevedoring promised that they were going to pursue such a plan at the container port. At the time, I said I wasn't going to "hold my breath", and good thing too. It never happened. And with the departure of American Stevedoring from the Red Hook piers, there's not much hope of holding anyone to that commitment. 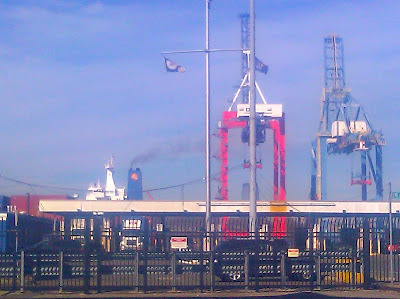 So, when you're driving along Hamilton Avenue, or along Van Brunt Street, and you see a big container ship docked at the Red Hook piers, know that it is idling, burning bunker fuel (see my previous post). Constantly emitting all of the harmful substances that we fought so hard to have eliminated from the cruise ships as a result of the deal that should soon bring shore power to the Brooklyn Cruise Terminal. What were they unloading? Bananas! 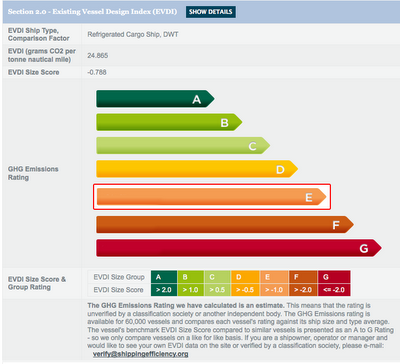 A quick check on the website "Shipping Efficiency", showed that this vessel's environmental ranking was an unimpressive "E". 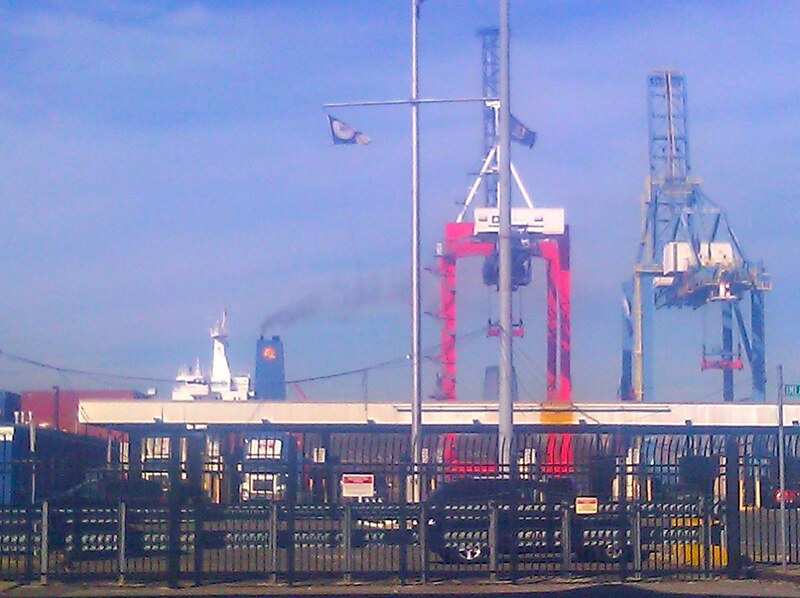 Who was paying for the added cost of this dirty ship's emissions to our residents? The fact is, the ship was being allowed to pollute our air, presumably in the name of economic viability - for the port, as well as the shipping company and the producers of the bananas. 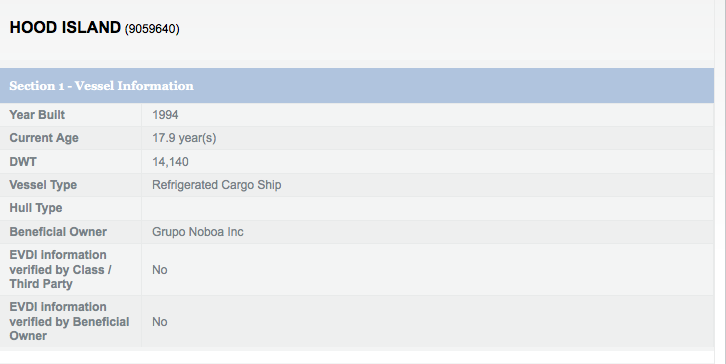 The owners of "Ecuadorian Line" are listed as Grupo Noboa, Inc. Again, some more digging revealed that Grupo Noboa also own the Ecuadorian banana producing giant, "Bonita". OK, so the company that was shipping the bananas was growing them as well. And who was the owner of this "Grupo Noboa"? Oh! This guy. (here) Álvaro Noboa. 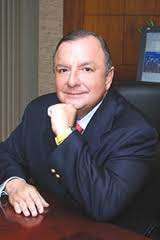 He's the richest man in Ecuador, a politician who has run for president multiple times, who, if you believe his own web site (here) is "The Philanthropist", a "successful businessman who is passionate about arts" - "a social and cultural awareness businessman" - "Alvaro Noboa encourages the awareness of how important nutrition is." "Álvaro Noboa gave a wheelchair to Katherine Valdez." "hundreds of thugs and security guards, arrived at the (Los Alimos) plantations and began to violently evict the striking workers. A second attack took place later in the afternoon. Up to two dozen workers were injured in the attacks, some seriously by gunfire. One worker later had his leg amputated due to the shootings. Noboa later personally admitted to having hired the thugs." USLEAP also states, "In 2011, Bonita responded to a new organizing campaign at the Alamos plantations with another anti-union campaign." He (and his company) has also been accused of breaching child labor laws and other nefarious activities. The 2002 article, "Blood on the Bananas", by David Bacon, outlines the dirty business that is the Ecuadorian banana industry, noting the use of child labor, exposing children as young as 12 to pesticides banned by the EPA in the US. Apparently, over recent years things have improved in the Ecuadorian banana industry, but at a time when we're all trying to make sure, for example, that we're not enjoying the technological experience that Apple products allow us, at the expense of Chinese workers who are being exploited and abused, it's also important to know what the real cost of a banana is - right? We need to pay attention not only to the plight of the Ecuadorian workers who are growing and harvesting the bananas, but to the environment and populations that are being harmed in the bananas' transportation. Certainly, shipping is the most efficient way to get bananas from Ecuador to New York, but once the ship is here, should it be idling and belching carcinogenic and asthma inducing smoke over our residents. Should the ships, whether at sea or at port, be allowed to burn the dirtiest diesel on the planet - bunker fuel - when there are other cleaner options? Sometimes arguments are made, as is the case with the revised customs inspections, that any additional cost will cripple an industry, or make it nonviable. Maybe there is an argument to make, in the case of the plan to move customs inspections off-site in Red Hook, that this is not a good plan - maybe the anticipated added truck trips are an undesirable burden - maybe the whole operation of the port needs to be revisited. But to say that it's the added cost of the U.S. Customs plan that's going to "break the camel's back" and drive business away - the added few cents that, if passed on, will surely deter consumers from drinking beer or eating bananas - that's a bit hard to swallow. Arguments about "extra costs" fall flat when we look at the costs that are already being born by others. Whether it's through the cost to our health of allowing ships to idle, burning dirty diesel with emissions equivalent to tens of thousands of cars at the edge of residential neighborhoods, or whether it's the cost to vulnerable banana workers, a half a hemisphere away, who have been abused and exploited by their billionaire employers (who may also be operating the dirty ships that transport their produce), there is already a price being paid. If we think that these costs are being born unfairly by others, then a choice needs to be made.